Home > Our Customers > Guest Blogs > GUEST BLOG: Jasper Fox Sr.
A warm welcome to Ensemble Video guest blogger and video champion, Jasper Fox Sr.! 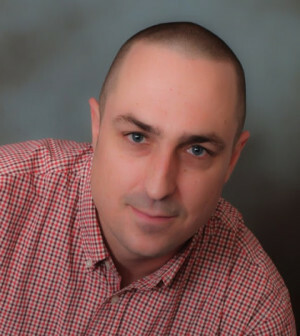 Jasper is an 8th grade earth science teacher and classroom technology pioneer, in Westchester County, NY. A passionate learner and truly reflective practitioner, Jasper continually introduces relevant technology to students and staff, and offers a transformative classroom experience. 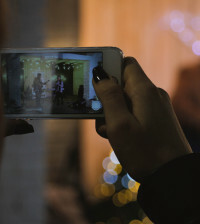 Educators are discovering the power of video instruction as a method for content delivery. Benefits for students include the ability for students to access content anytime, anywhere; to pause, re-watch, and review videos; and even for quick learners to skip ahead, once they’ve absorbed the ideas. This allows class time to shift into a more individual, differentiated experience for students. 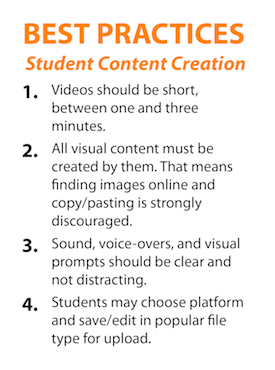 Video instruction really becomes meaningful is when students begin creating their own course content! When students become creators, they use higher-order thinking skills, and increase their understanding by being able to explain concepts and ideas. For example, when studying rocks, students find a particular type of rock outside of school and then make a short video explaining the characteristics of this rock and how those features are used to determine the type it is. During the process, a student will become able to explain a topic in their own words, which means they develop expertise. This signals a deep amount of knowledge not normally found with more traditional, passive methods of instruction. Encouraging students to develop their content outside of class allows them to cultivate content connections within their world. Smart phone technology makes this very easy and effective. 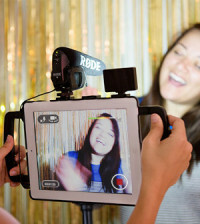 Often, much of the video can be recorded and edited right on a students’ device. Allowing for this and reducing restrictions and parameters builds an environment where learning is not restricted to within the classroom. Once students have researched their topics, had discussions, and created their screencasts, they need to put them online so that others besides just the teacher can view them. This is such an important part of this process. Truly special work occurs when students know many others will see and learn from it. Additionally, teachers can promote student content to a much broader audience, and help end the practice of being the only other person to see student work. 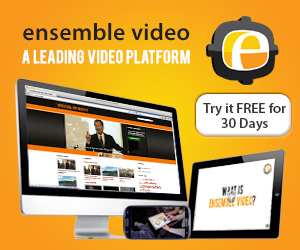 The Ensemble Video Dropbox application truly shines for transcoding, managing, and publishing student videos. With this feature, I can easily configure an upload point, where students can add their videos to my Ensemble Video Media Library. 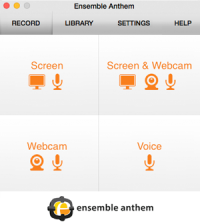 Ensemble is able to ingest just about any file type, from just about any device they can throw at it. Once uploaded to my Media Library, I moderate the videos and publish them to an Ensemble Video Playlist. 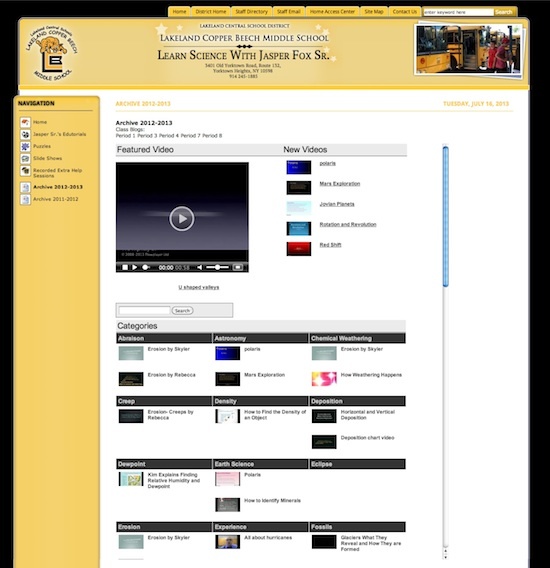 Providing the Video Dropbox link on the same page as my student Playlist keeps everything centralized, and with minimal hassle each student can upload his or her unique content, easily and quickly. From the teacher’s perspective, this removes many hours of uploading the videos themselves, which usually would need to be done on-site due to students saving the files on school servers. The Dropbox feature encourages anytime, anywhere, intrinsic learning because it is always available. A special thanks to Jasper Fox, Sr. for giving us a glimpse into his innovative classroom, and sharing his use of Ensemble Video. If you would like to know more about Jasper’s classroom, he has a wealth of information available online. Check out his BLOG, follow him on TWITTER, like him on FACEBOOK, have a look at his SOCIAL STREAM, and browse his Ensemble Video Playlists on his TEACHER WEBSITE. You can also view our two previous Ensemble Notes articles focusing on Jasper: QR Codes in K12 and Higher Ed and IN THE TRENCHES: Jasper Fox, Sr.